We talk about really technical things in this blog. This is primarily my personal note when I am studying my subject -- electrical engineering. This cover wide aspect of issues, including signal processing, RF and others. The first topic is image processing -- DCT, sub-band filtering and many others image processing released issue. If you have any thing to share, finding any mistake in my blog, please leave me a message. It has been almost 6 months since I posted my last Blog. Adsense sent me a PIN code and that reminds me that I had a blog.. well and someone is reading it.. I should have been constantly updating this blog so to make the content richer. CELP -- a voice compression technology. - Reuse of legacy technologies such as Orthogonal Frequency Division Multiplexing (OFDM), forward error correction (FEC) coding, interleaving and quadrature amplitude modulation (QAM) mapping should be maintained to keep costs down and ease backward compatibility. - employs multiple antenna systems for both the transmitter and the receiver. This technology is referred to as multiple-input multiple-output (MIMO), or smart antenna systems. - believes both MIMO technology and wider bandwidth channels will be required to reliably satisfy the higher throughput demands expected from 802.11n. - fast channel adaptation should be managed at the PHY Layer without MAC interaction. Once the initial adaptation is established, using over-the-air signaling in a timely fashion, the MAC layer will need to establish and maintain adaptation to wireless channel conditions. * providing with new aggregate exchange sequences. * allows a responder to aggregate MPDUs in a reverse direction in response to an initiating station transfer without initiating a new transfer. * able to transfer data to multiple destinations using new MPDU formats. - resolve information from multiple signal paths using spatially separated receive antennas. - Spatial Division Multiplexing (SDM) spatially multiplexes multiple independent data streams, transferred simultaneously within one spectral channel of bandwidth. - requires a separate radio frequency (RF) chain and analog-to-digital converter (ADC) for each MIMO antenna. - where multiple MAC Protocol Data Units (MPDUs) are aggregated into a single PHY Protocol Data Unit (PPDU). - aggregate exchange sequences are made possible with a protocol that acknowledges multiple MPDUs with a single block acknowledgement (Block ACK) in response to a block acknowledgement request (BAR). Caused by the need to reove variable interpacket timing. Require collection packets and holding them long enough to allow the slowest packet to arrive. i) interpolate for lost packets by replaying the last packet received. ** points of reference for conversion TCP/IP - PSTN. iv) Multipoint Control Units (MCUs) to provide conference. v) Proxies Server also are used. - GSM, WLAN: mobile nodes communicate directly with some centralized access point. - MCL is a loadable Microsoft Windows driver. - virtual network adapter, the rest of the system the ad-hoc network appears as an additional (virtual) network link. - An interposition layer between layer 2 (the link layer) and layer 3 (the network layer). - To lower layer software, another protocol running over the physical link. - DSR operate entirely "on demand"
* ZRP divided the topology into zones and seek to utilize different routing protocols within and between the zones based on the weakness and strengths of these protocals. * Size of zones is defined by a parameter r decrible the radius in hop. 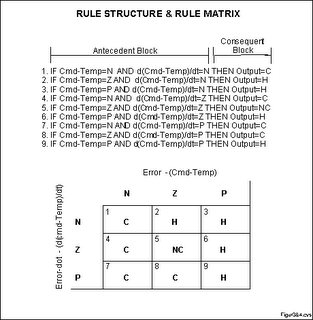 - rule-based, example of rules is "IF (process is too hot) AND (process is heating rapidly) THEN (cool the process quickly)"
- Error and dot-error were modified by the adjectives "negative", "zero", and "positive"
- rule structure and rule matrix are used to define the rules for operation, example of rule structure and rule matrix. - Membership functions associates a weighting with each of the inputs that are processed, define functional overlap between inputs, and ultimately determines an output response. 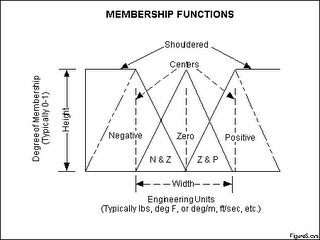 - shape of membership function of triangular is common, but bell, trapezoidal, haversine and, exponential have been used. - degree of membership of various error inputs and dot-error inputs determine the output. - logical products is combined or inferred by max-min'd, max-dot'd, averaged or root-sum-squared method. MSAP is a single access point interface to LLC. MSAP is identified by a single individual MAC address. - less than 8 x 10^-8 per octet. Can a wi-fi device communicating with an AP while at the same time communicating with another wi-fi device via adhoc-mode (The two wi-fi devices are not talking via the AP)? I read an article on a technology, known as mesh networks. I visited the website www.meshnetworks.com. but it seems to me the website has been moved. - every wi-fi device act as a router to the AP. - instead of communicating to the nearest AP, device communicate with nearby device and hop through it. - a device can hop to an AP after several hop. - reduce link distance,increase network throughput. I am not thinking of a meshnetwork application, but rather a very simple, wi-fi headset that can communicating with a computer using ad-hoc mode, while at the same time won't preventing the computer to communicate to the network via a AP. If any one who know the answer to my question, please kindy leave a comment. Thanks. * MAC-48 specification, specify a 48-bit address. * An example of a MAC-48 address would be "00-08-74-4C-7F-1D"
* MAC address is commonly used by services provider and network administrator to bound a certain services or network authority to a computer. * MAC addresses are permanent by design. It is possible to modify, or "spoof", the MAC address that is reported by the OS. An unique number that devices used to identify and locate each other in a computer network. Similar to a mailing address in read world. * Translate to domain name by domain name server (DNS) for easy memorization by human. * Some of the IP address are reversed for private network, i.e. if you setup a private network, you should assign this set of IPs to identify each computer on your network. * IPv4 are commonly used, however, the 32-bit addressing space are running out and hence IPv6 with 128-bit addressing space are developed, but not yet widely deployed. * UDP no control over the order the packets are received and no guarantees on whether the packet is delivered, those issues has to be handled by upper layer in the OSI/RM. - Dynamic rate shifting, data rates automatically adjusted to compensate noisy environment. My boss wants me to source some of the wi-fi modules in the market, and if you know any good and cheap wi-fi module or any internet resource regarding to wi-fi, please leave me a message on this blog. Also I will be studying on wi-fi from now on. - Was adopted in December 1990 for use in the Integrated Services Digital Network by CCITT Study Group XV. - Most of the international video coding standards, MPEG-1, MPEG-2/H.262 and H.264 are based on H.261. - Has a total latency for compression and decompression less than 150ms. - Bitrates are multiple of 64kbps, and is also known as p * 64 compression. - Transformation block is 8 * 8 DCT used in JPEG lossy conpression modes. - The quantization and Huffman code same as these in baseline JPEG. - The step sizes associated with each of the quantizers are uniformily scaled from one DCT to another to avoid excessive fluctuations in bit rate. - The chrominance components (U and V) are subsampled by two. - 4 luminance block, a U, V pair, (Y:U:V is 4:1:1 due to subsampling) is known as a macro-block. - Macro-block can either be inter-coded and intra-coded. - Intra-coded block are coded independently of previous frame. - Inter-coded block use MC predictive feedback loop. - Each Inter-coded macro-block is assigned one motion vector. Predictive Feedback techniques improve the compression performance. - Delta Pulse Code Modulation (DPCM) are completely used feedback strategy. - only sending the difference of current data and some previously stored data via. The following is usually used to measure the performance of a image compression scheme. - measure how much compression you can get. - important for implementation, higher bit rates require more memory and data transfer in implementation, lower the better. Common image compression standards include JPEG, JPEG2000, MPEG-1 (VCD), MPEG-2(DVD), MPEG-4. Please notice the MP3 is not equal to MPEG-3, MP4 is not equal to MPEG-4. MP3 are usually referring to audio file compressed in MPEG-1 layer-3 format. MP4 are a file format defined in MPEG standard (I don't remember which part of MPEG defines MP4). - DCT can be regarded as a special kind of subband filter, with no overlapping in bands. subband decomposition are usually reserved to descript decomposition scheme with overlapping. - Due to the overlapping characteristic, subband decomposition usually have a less blocking when compared with block transform. We talk about really technical things in this blog. This is primarily my personal note when I am studying my subject -- electrical engineering. This cover wide aspect of issues, including signal processing, RF and others. The first topic is image processing -- DCT, sub-band filtering and many others image processing released issue. If you have any thing to share, please leave me a message.